BBC Music Magazine 5 stars; Music Web International: Recording of the Year 2006; International Record Review: outstanding. Considered by many to be the most important Russian composer since Shostakovich, Sofia Gubaidulina is well represented in the BIS catalogue. The present disc will be welcomed by her many admirers, as it includes the world première recording of her flute concerto, composed in 2005 and dedicated to Sharon Bezaly, the performer on this disc. Its title, '...The Deceitful Face of Hope and of Despair', is taken from T.S. Eliot's poem Ash Wednesday, but as the composer herself writes in the liner notes: 'It was by no means my intention to represent the emotional states mentioned in the title by musical means. I was far more concerned with musical and acoustic actualities.' The solo part calls for three different instruments (flute, alto flute and bass flute) and, with the extended orchestra, covers a very wide range of colours and pitches. The work explores 'difference tones', an acoustic phenomenon whose varying aspects come to symbolize the concepts of 'hope' and 'despair'. 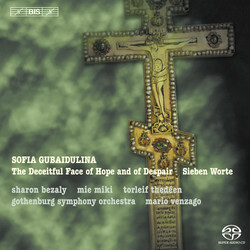 Accompanying the one-movement concerto is Sieben Worte (Seven Words), in which Gubaidulina follows in the footsteps of Schütz and Haydn, setting in music the pain and wonder of Christ's last moments on the cross. The seven-movement suite for cello, bayan (Russian-style button accordion) and strings employs a number of musical symbols, but is, like the flute concerto, anything but a cerebral exercise. Rather it is a work of great emotional impact by a composer who has stated: 'I can't reach a single musical decision except with the goal of making a connection to God. If I separated the religious goal from the musical one, music would have no meaning for me.' The emotional content is given its full weight in this interpretation by Torleif Thedéen and Mie Miki, together with the strings of Gothenburg Symphony Orchestra conducted by Mario Venzago.